Information provided on the PAII Forum is to be for the edification and support of the Innkeepers who utilize the service. I have asked permission to re-print PAII Forum information off-line, should vendor to vendor communication begin. I have been granted that permission by AnneMarie DeFreest, Board Chair Professional Association of Innkeepers International. Register NOW! to attend our FFA Industry Webinar on Google Local Business Listings. Note: FFA indicates Training offered by Acorn that is “Free For All”, and DOES NOT count toward the “1 Free Pass” provided to Non-Acorn IS Customers who wish to “try out” an Acorn IS Customer Specific Webinar. Not all Google MAP listings show the tag line: Category: Hotels or Category: Bed and Breakfasts, etc. as indicated on the B listing circled below. Look at the A listing, they are a Hotel, and they don’t have the tag line: Category: Hotel that the B listing does on these Google Map listings. The snapshot above was used INACCURATELY to try to prove the point that this B&B did not use “Hotel” as a Category on their Local Listing. As you read further, you will see for yourself that this B&B indeed did have “Hotel” words in 2 of their 5 Categories. This “Tag Line” does not show the full extent of the Categories assigned to any business. This “Tag Line” does not appear on all listings, even when claimed. You must click on through to the Local Business Detail Page to see all Categories. All categories assigned to this listing may be seen once you click the “+” beside the word Categories. Look at the Red Area Above. “Hotel” Categories indeed have been assigned in this Google Local Listing. See #3 and #4 below. It has to do with claimed and un-claimed listings. A listing must be claimed to have more than one Category defined. Otherwise, unclaimed properties get their one Category defaulted by Google. 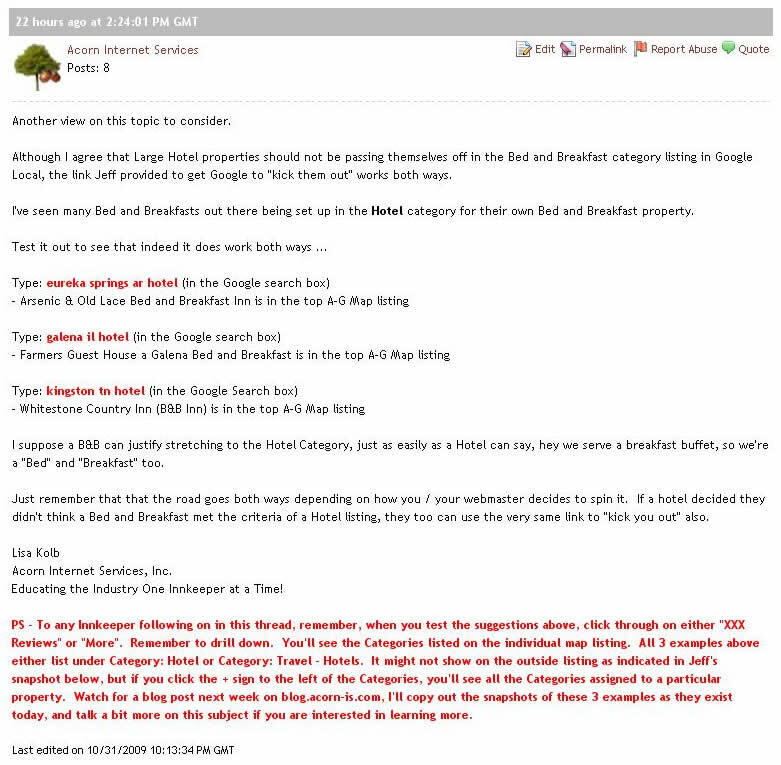 Typically un-claimed B&B listings default to the Bed & Breakfast category, and un-claimed Hotel listings to the Hotel Category, etc. This particular B&B had the maximum of Categories (5) defined. Come to the Webinar to learn more on Claimed and Un-Claimed listings! The definition of the “Proper Category” is considered to be one of the most important of the 41 items listed in the Local Search Ranking Factors documentation. The sites mentioned in the PAII Forum post do indeed have “Hotel” phrases assigned as Categories. You simply have to drill down far enough to see them. 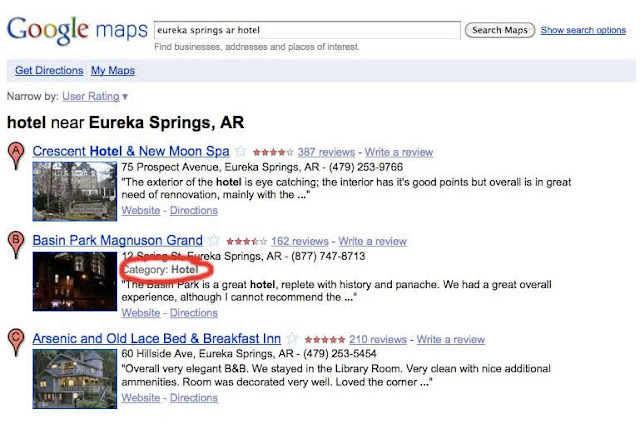 The Categories defined contributed to the business showing up in Google Local (Map or Web) for “Hotel” phrases. 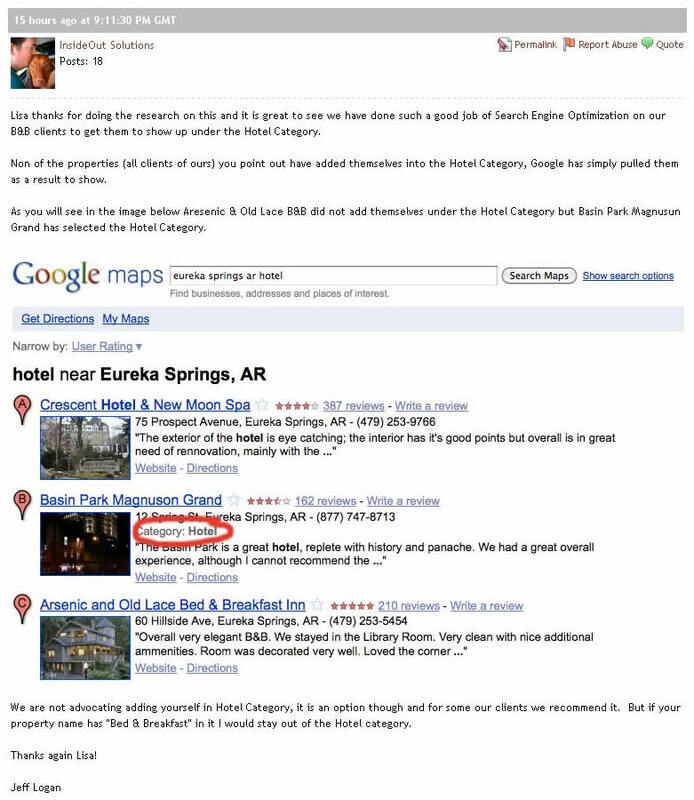 Acorn has helped teach 100’s of innkeepers about Google Local Business Listings. 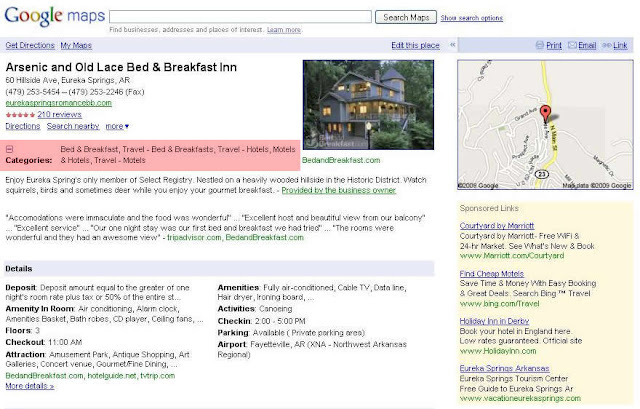 It is every innkeepers choice as to what Categories best suit their marketing strategy. It is important to remember that Google provides the opportunity for your peers to file a report if they believe you are spamming the Google Maps listings. This entry was posted in ethics, google, paii by admin. Bookmark the permalink. This is an great post, I will definitely be adding your site to my blogroll.